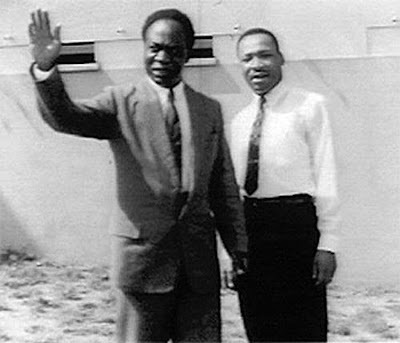 Dr Kwame Nkrumah can easily be described as a man who believed in African Unity and pushed for self governance. He was Ghana’s first president and prime minister who led the fight against British colonialism to gain Ghana’s independence. He was also one of the founding fathers of the Organization of African Unity. These 21 quotes by Kwame Nkrumah will leave you feeling nothing but love for fellow Africans, the kind of love that brings about unity, the unity that Dr Nkrumah so passionately advocated for. 1. I am not African because I was born in Africa but because Africa was born in me. 2. It is clear that we must find an African solution to our problems and that this can only be found in African unity. Divided we are weak; united, Africa could become one of the greatest forces for good in the world. 4. Action without thought is empty. Thought without action is blind. 5. Countrymen, the task ahead is great indeed and heavy is the responsibility; and yet it is a noble and glorious challenge – a challenge which calls for the courage to dream, the courage to believe, the courage to dare, the courage to do, the courage to envision, the courage to fight, the courage to work, the courage to achieve – to achieve the highest excellencies and the fullest greatness of man. Dare we ask for more in life? 6. Africa is a paradox which illustrates and highlights neo-colonialism. Her earth is rich, yet the products that come from above and below the soil continue to enrich, not Africans predominantly, but groups and individuals who operate to Africa’s impoverishment. 7. The forces that unite us are intrinsic and greater than the superimposed influences that keep us apart. 8. The result of neo-colonialism is that foreign capital is used for the exploitation rather than for the development of the less developed parts of the world. Investment under neo-colonialism increases rather than decreases the gap between the rich and poor countries of the world. 10. All people of African descent, whether they live in North or South America, the Caribbean, or in any part of the world are Africans and belong to the African nation. 11. Freedom is not something that one people can bestow on another as a gift. They claim it as their own and none can keep it from them. 12. It is only the ending of capitalism, colonialism, imperialism and neocolonialism and the attainment of world communism that can provide the conditions under which the RACE question can finally be abolished and eliminated. 13. We face neither East nor West: we face forward. 14. It is far easier for the proverbial camel to pass through the needle’s eye, hump and all than for an erstwhile colonial administration to give sound and honest counsel of a political nature to its liberated territory. 15. We all want a United Africa, United not only in our concept of what unity connotes but united in our common desire to move forward together in dealing with all the problems that can best be solved only on a continental basis. 16. The best way of learning to be an independent sovereign state is to be an independent sovereign state. 18. The masses of the people of Africa are crying for unity. 19. A state in the grip of neo-colonialism is not master of its own destiny. It is this factor which makes neo-colonialism such a serious threat to world peace. 20. It is far easier for the proverbial camel to pass through the needle’s eye, hump and all than for an erstwhile colonial administration to give sound and honest counsel of a political nature to its liberated territory. 21. READ ALL OVER AGAIN! !